Using Amazon DynamoDB Accelerator (DAX) from AWS Lambda has several benefits for serverless applications that also use Amazon DynamoDB. DAX can improve the response time of your application by dramatically reducing read latency, as compared to using DynamoDB. Using DAX can also lower the cost of DynamoDB by reducing the amount of provisioned read throughput needed for read-heavy applications. For serverless applications, DAX provides an additional benefit: Lower latency results in shorter Lambda execution times, which means lower costs. Connecting to a DAX cluster from Lambda functions requires some special configuration. In this post, I show an example URL-shortening application based on the AWS Serverless Application Model (AWS SAM). 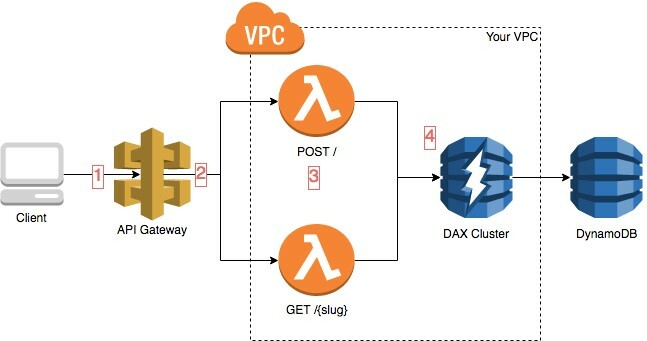 The application uses Amazon API Gateway, Lambda, DynamoDB, DAX, and AWS CloudFormation to demonstrate how to access DAX from Lambda. The example application in this post is a simple URL shortener. I use AWS SAM templates to simplify the setup for API Gateway, Lambda, and DynamoDB. The entire configuration is presented in an AWS CloudFormation template for repeatable deployments. The sections that create the DAX cluster, roles, security groups, and subnet groups do not depend on the SAM templates, and you can use them with regular AWS CloudFormation templates. Like all AWS services, DAX was designed with security as a primary consideration. As a result, it requires clients to connect to DAX clusters as part of a virtual private cloud (VPC), which means that you can’t access a DAX cluster directly over the internet. Therefore, you must attach any Lambda function that needs to access a DAX cluster to a VPC that can access the cluster. The AWS CloudFormation template in the following section contains all the necessary pieces and configuration to make DAX and Lambda work together. You can customize the template to fit the needs of your application. The client sends an HTTP request to API Gateway. API Gateway forwards the request to the appropriate Lambda functions. The Lambda functions are run inside your VPC, which allows them to access VPC resources such as your DAX cluster. The DAX cluster is also inside your VPC, which means it can be reached by the Lambda functions. Let’s start with the AWS CloudFormation template (template.yaml). The first section of the code contains the AWS CloudFormation template, AWS SAM prologue, and AWS SAM function definition. Description: A sample application showing how to use Amazon DynamoDB Accelerator (DAX) with AWS Lambda and AWS CloudFormation. This example creates its VPC and subnets so that they are defined using references to later sections of the file. If the VPC already exists, you should use the existing identifiers instead. Using AWS::Serverless::Function takes care of creating the Lambda function definition with the appropriate permissions in addition to creating an API Gateway endpoint that calls the Lambda function on each HTTP request. Users access the URL shortener through this endpoint. The next section of this code example creates a DynamoDB table. This table has only a single hash key (KeySchema has only the id column). The ProvisionedThroughput ReadCapacityUnits are kept low because DAX serves most of the read traffic. DynamoDB is called only if DAX has not cached the item. Now the template specifies the DAX cluster. Next, the template sets up a security group with a rule to allow Lambda to send traffic to DAX on TCP port 8111. If you look earlier in this post at the serverless function definition, the VpcConfig stanza refers to this security group. Security groups control how network traffic is allowed to flow in a VPC. Finally, the template creates the networking configuration for the example, including the VPC, subnet, and a subnet group. This part of the template creates a new VPC and adds a subnet to it in the first available Availability Zone of the current AWS Region, and then it creates a DAX subnet group for that subnet. DAX uses the subnets in a subnet group to determine how to distribute the cluster nodes. For production use, it is highly recommended that you use multiple nodes in multiple Availability Zones for redundancy. Each Availability Zone requires its own subnet to be created and added to the subnet group. I present the URL-shortening code in a single file (lambda/index.js) for simplicity. How the code works: A POST request takes the URL, creates a hash of it, stores the hash in DynamoDB, and returns the hash. A GET request to that hash looks up the URL in DynamoDB and redirects to the actual URL. The full code example is available on GitHub. // or use a new instance. * Compute a unique ID for each URL. * then return that in Base32 representation. * If the salt is provided, prepend that to the URL first. * This resolves hash collisions. // Retry with the attempted ID as the salt. // Eventually, there will not be a collision. The Lambda handler uses environment variables for configuration: DDB_TABLE is the name of the table containing the URL information, and DAX_ENDPOINT is the cluster endpoint. In this example, these variables are configured automatically in the AWS CloudFormation template. The dynamodb instance is at global scope so that it persists between function executions. It is initialized on the first run and continues to exist as long as the underlying Lambda instance exists. As a result, you don’t have to reconnect on every execution, which can be an expensive operation when using DAX. By reusing the dynamodb instance for both direct DynamoDB access and DAX access, the code also shows that the DynamoDB and DAX clients are source-compatible, except for the initialization code. You package Lambda functions as .zip files for deployment. For this example, the .zip archive must contain the lambda directory (for the example code) and the node_modules directory (for the dependencies) so that Lambda has everything it needs to run the function. Run all the following commands from a Bash shell. Install both npm and the AWS CLI if you haven’t already. This code creates geturl.zip, which is the Lambda package. Now you need an Amazon S3 bucket to put the package in so that AWS CloudFormation can find it. Then, create an AWS CloudFormation package of the code in that bucket. Finally, deploy the AWS CloudFormation stack to create all the resources. You can now access the URL shortener by using the API Gateway endpoint that was created by the AWS CloudFormation template. The URLs created by API Gateway contain a REST ID that is specific to each endpoint. You can find the ID for the example endpoint using the AWS CLI. To shorten a URL, use the following command. This command returns a “slug” that you can use to go to the URL. You also can create a custom URL by using Amazon Route 53. In this post, I showed how to use AWS CloudFormation to create a Lambda function that uses DAX and DynamoDB to implement a simple URL shortener. The AWS CloudFormation template includes all the configuration necessary to ensure that the Lambda function can reach the DAX cluster and use it to access the data in DynamoDB. By combining the high performance of DAX with your serverless Lambda applications, you can both increase your performance while reducing your costs which is a win for you and your customers. Jeff Hardy is a software development engineer at Amazon Web Services.